Contribute Video is the ability for the teacher to broadcast a video feed and their audio to remote participants. Think of this feature like a video call. The remote student or participant would be able to see the teacher’s LED screen anyway through regular Contribute Cloud use – this feature adds the ability for the teacher to turn on a video and audio feed (say a MIC and Webcam on a laptop) so that the remote participants also get the full in classroom experience – but remotely. To turn on the video and mic, the teacher needs to press the video call button. This will turn red. 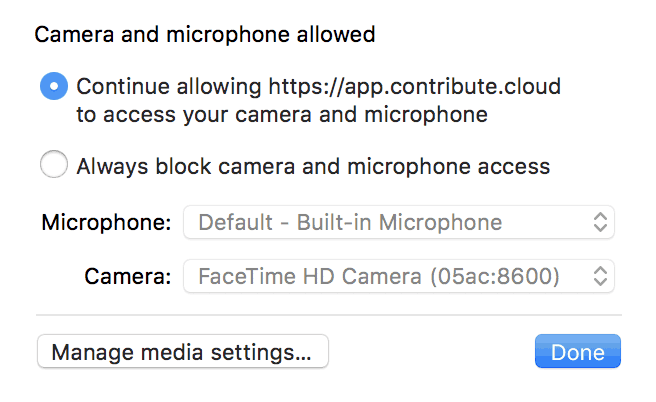 There will be a notification asking that Contribute Cloud is able to use the microphone and webcam. Exact wording depends on your browser. Once you allow this, you will be streaming live video and audio to your participants. They are able to see this through the Cast window on their screens. Click on this window to pop it open an reveal the video feed.